Embark on an 8-day cruise aboard our three-master Le Ponant, to discover the most beautiful sites of the Aegean Sea and Turkey. 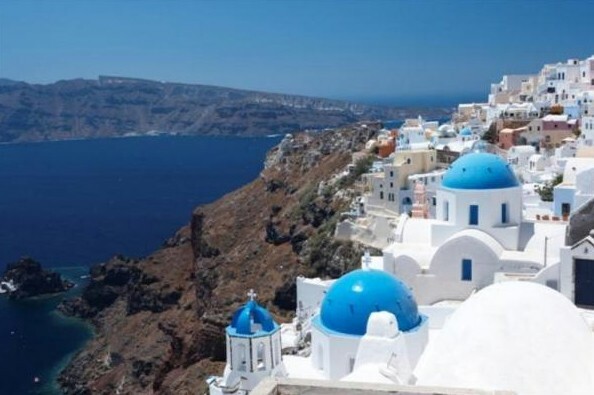 Cruise between Greece and Turkey, to see the most beautiful sites in the Aegean Sea. 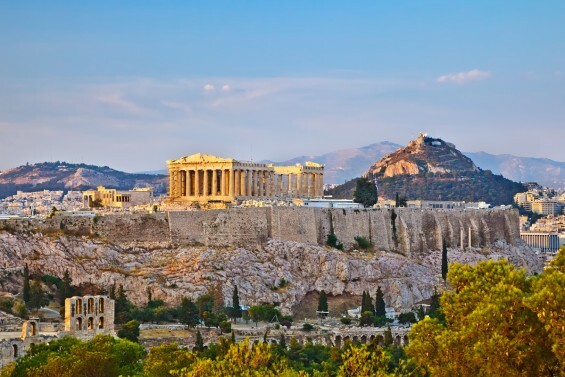 Visit numerous UNESCO World Heritage Sites in Athens, Patmos, and Kusadasi. Other pearls of the Cyclades now await you: the unique Santorini, unfurling the grandiose circle of its caldera, and Mykonos, with its paved small streets and blue-and-white houses. 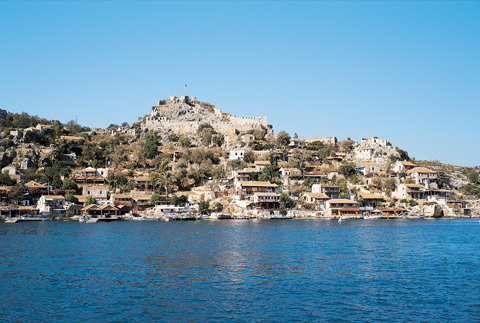 Your voyage continues with sightseeing around Patmos. Le Ponant will then sail towards Kusadasi, gateway to the fabulous ancient site of Ephesus and its huge library, a real jewel of white marble. The Greek capital city is located on the edge of the Saronic Gulf, in the east of the country. It bears a plural name in reference to the first villages that surround the Acropolis. Be enchanted by the rocky plateau presided by its monuments listed as UNESCO World Heritage. In the city below, you can visit some of the liveliest districts in Athens: Plaka, with its maze of colorful streets, and where, in the evenings the drifting aroma of moussaka and garlic prawns tickles your taste buds. Don’t miss anything of the city’s cultural past. Pay a visit to the National Archaeological Museum, or the Cycladic Art Museum. Located to the west of Mykonos, Syros is an attractive island in the Cyclades. It has been inhabited since early antiquity, as you’ll discover by visiting the archaeological museum in Ermoupoli, its capital built in the shape of an amphitheater and stretching out over two hills. Don’t miss the historical district, where the beautiful houses are evidence of the island’s strategic location for trade, between the East and the West. Admire the superb Agios Nikolaos Church or the Church of the Church of the Assumption of Virgin Mary. 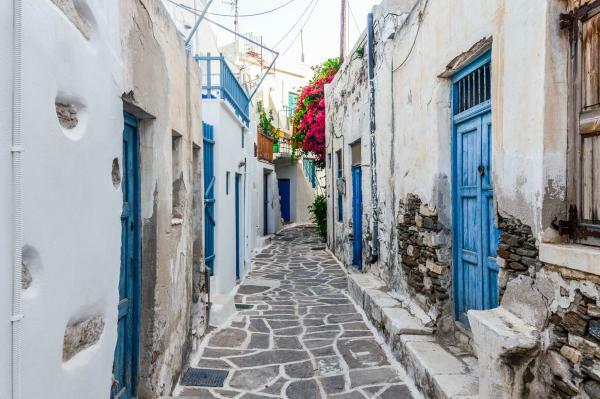 Further on, in the medieval town of Ano Syros, succumb to the charms of its stairways and arched passageways, the small, white houses decorated with bougainvilleas, and the sweetness of the ambient air. The spectacular volcanic island of Santorini stands out proud in the Cyclades. Its basalt cliffs offer particularly expansive views of the Aegean. To enjoy these views, you can head for the capital, Fira. Its floral belvederes of bougainvillea provide a bird’s-eye view of several thousand meters of coastline. 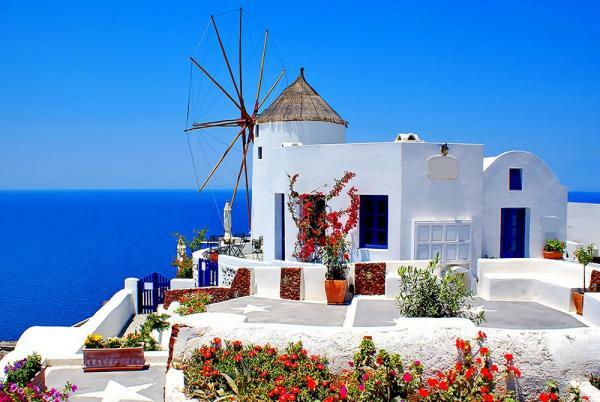 Further away, the gorgeous village of Oia looks like a stairway of blue and white houses on the slopes of the volcano. In the south of the island, visit the stunning ruins of Akrotiri, an ancient city destroyed by an eruption and covered with a thick layer of lava stone. 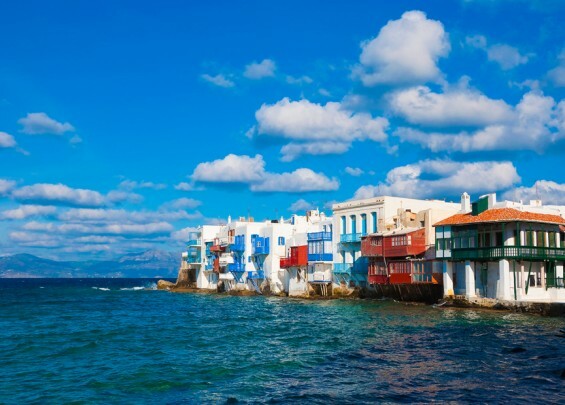 Nicknamed “little Venice”, Mykonos is famous for its Alefkandra district where houses are built right on the water’s edge. Their multi-colored loggias are emblematic of this Cyclades island, as are the pelicans and windmills. You can get close up to the birds on the quaysides of the old port. Up on the hillside, you can see the windmill sails turning. In the cobbled streets of the pedestrian center, bougainvillea bedeck immaculate facades. As you weave in and out of the little streets, snatches of coastline undoubtedly call you to the island’s beaches, the quietest of which can be found on the northern coast. 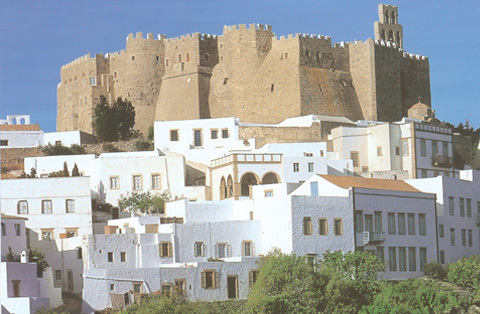 Patmos is one of the legendary must-see islands in the Dodecanese. This is where Saint John resided, presumed author of the last book in the Bible. The cave of the Apocalypse and the Saint-John-the-Theologian Monastery are dedicated to him. These sites, which are listed by UNESCO as World Heritage, are located at the top of a hillside planted with vines and orchards. On the shore, the crystalline coves of Kambos and Lampi offer absolutely gorgeous swimming areas. Be drawn to the bustle in Skala harbor and its taverns, famous for their fish soup and tiropita, which is a type of pasty filled with fresh Patmos cheese. With its particularly agreeable climate, the island of Rhodes invites you to walk its pathways and discover its immaculate villages and sumptuous medieval city, a UNESCO World Heritage site. At the center of the island the mountains are covered in forest and on the western slopes we find vineyards and crops. 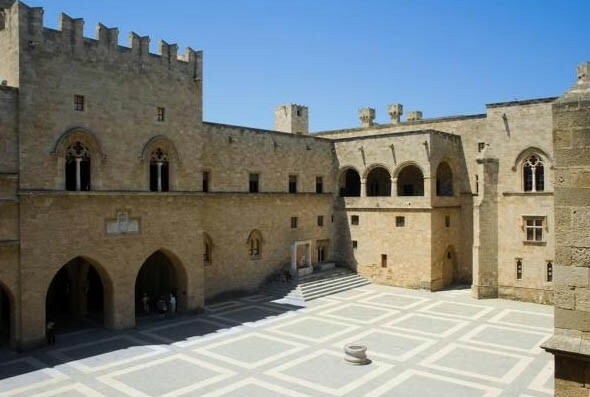 Rhodes also owes much of its charm and its character to the Knights of St. John who reigned over the island from 1310 to 1522 and built impressive defensive walls punctuated with majestic gateways. 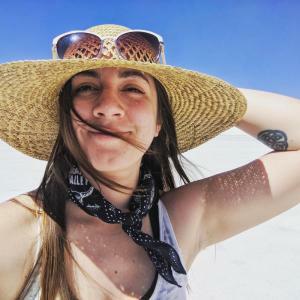 Do not miss this delightful island with its peaceful beaches, its large walkways and its lively nightlife, perpetuating the myth of the famous Colossus, the legendary statue that is one of the Seven Wonders of the World. Disembark after breakfast. Transfer to the airport to begin your journey home or continue your travels on your own.